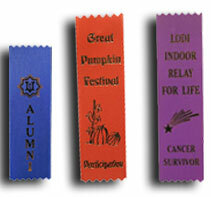 Custom printed award ribbons are available in multiple colors and a large selection of stock logos. You may purchase your custom printed ribbon with a string and event card or in bookmark style. If you want to attach your ribbons to a shirt or blouse, you can order them with double sided tape or safety pins. You may combine ribbon events and colors to avoid set-up charges, but you must keep some of the printing the same on all ribbons (up to 4 line changes are included in price). Additional line changes are $.75 each. If you have questions or prefer to place your order by phone call 1-800-787-8777 for help. Orders in quantities of less 100 ribbons will have a $10.00 setup charge.